Michael Britt has an informative article on Rough-legged Hawks in the current issue of New Jersey Birds. The trails at DeKorte Park in Lyndhurst are closed today (Wednesday). NJMC staffer Jim Wright's talk at New Jersey City University will begin at 2 p.m. today. Directions to the campus are here. An earlier post about the talk is here. 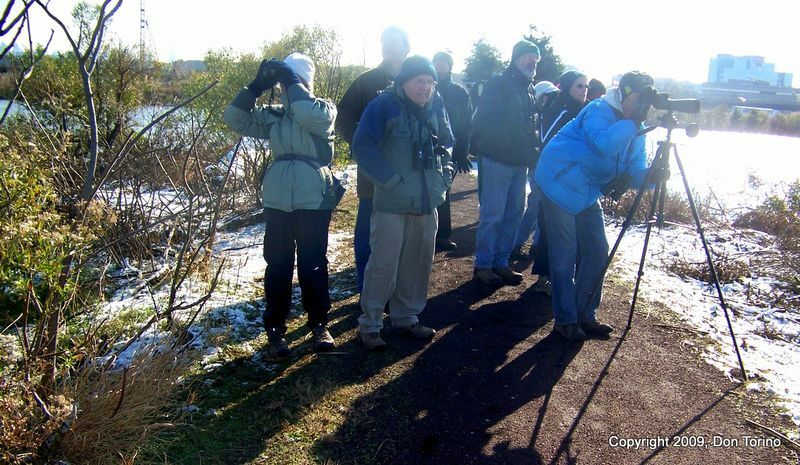 Don Torino reports: We had a nice First-Sunday-of-the-Month nature walk at Mill Creek Marsh Sunday morning. A bright sunny morning but windy and cold. A hardy group of 15 people enjoyed a beautiful Meadowlands morning (above). Next up: A special "Hawk Talk and Walk" on Sunday, Dec. 13, at 10 a.m. at DeKorte. Click "Continue reading…" for last Sunday's full list.